This earth construction studio seeks to combat the stigma associated with mud architecture by providing sustainable, low-cost and attractive design that mitigates flooding and heat. Landscaping immediately to the East and West perimeter reduce heat gain, improve rain water percolation, and increase soil fertility. Large roof overhangs protect the earthen walls from solar penetration and decrease water damage caused by rain. Rat trap bond masonry provides cavity walls that reduce thermal conductivity. Strategic openings in the wall allow hot air to escape. An air cavity at the roof reduces solar penetration into the space. The foundation is a foot and a half above ground level, protecting the bricks from splashing water. This earth construction will endure floods and provide a cool environment during hot summer days. Students can enter the space through one of two open doorways. When students first come in, they are part of the civic space of the courtyard. Local plants populate the fertile raised garden bed. Seats formed from the building’s foundations line the courtyard. Inside the classroom, shelves settle into the brick walls to hold student belongings while class is in session. The neighboring storage room holds class materials like clay, gravel, and sand. The Diakounda Arts Centre Cafeteria embraces an internal patio while encouraging an immediate connection with the demonstrative farm, spaces for seedlings, external communal areas and shaded areas below trees. The design proposal works as a node within the masterplan that permits fluid passage through the building while welcoming momentary pauses in a variety of private and public patios, external gradual staircases, and gardens. The connection between farm, plant nursery, kitchen and table is a principal catalyst for the layout. This small scale culinary and agricultural laboratory will insure an emphasis on healthy food and sustainability in the new arts centre. The cafeteria presents a strong frontal façade to the main thoroughfare of the masterplan. Upon entry the diner is greeted by an intimate central patio to the right and a small seed nursery to the left. Once past the monumental earthen walls the true permeable nature of the building can be appreciated. The dining room surrounds the central patio on three sides and opens through a perforated wall to the large public stairs and communal patio on the western side. In good weather this area will expand the capacity of the dining room past the one hundred person internal occupancy. The kitchen is connected directly to the seed nursery and aromatic garden and also has a private large staircase and courtyard for such activities as cleaning produce. The southern side has the largest agricultural area which is dedicated to the demonstrative farm. The building is raised 60 cm on a recycled tire foundation, and covered by a composite beam structure made of framing wood with a zinc roof and plywood drop ceiling for noise and heat mitigation. Humans have excavated the earth for building material since the beginning of the Holocene Period. Excavation has proven useful for keeping the building cost affordable and incorporating local materials. Excavation, however, leaves a site scarred and often unusable. The excavated areas are also susceptible to erosion in their raw marred state, and this exacerbated the scarring. The Inhabitable Scar embraces the scar and proposes both an educational example of earth construction and a solution to this unavoidable consequence of earth construction and a solution to this unavoidable consequence of earth construction. The Inhabitable Scar investigates the relationship to ground by developing an embedded classroom space for the students to experience and learn about the various earth constructions. The project takes the excavated material to make bricks that not only hold back the earth but provide seating for the classroom spaces. Students will experience relationship to ground through undulating terraces composed of the local earth. The local earth material is also utilized in various construction methods including poured earth. The walls are composed in such a way to divide the spaces for multiple learning scenarios and also for maximum ventilation. The project accepts the scar and makes it a useful learning tool to enhance the students’ experience. 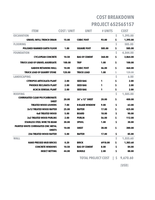 The budget for the entire project estimates to $8775. This earth construction classroom/workshop is a functional demonstration of Senegalese earth construction types and utilization of the sites’ conditions and resources as a means to enrich the built environment. The aim of the classroom is to help teach construction through multiple examples: the pouring of the foundation you stand on, how to construct the surrounding rammed earth walls, and how bamboo can be connected in a variety of ways to form cost effective support systems. The classroom is well vented and lit from above with a screen of mud bricks and bordered by a work area. The walls consist of rammed earth and mud bricks atop a poured earth foundation. Bamboo supports are outstretched from the walls to support the roof and also are imbedded in the foundation for additional support. When multiple units are constructed together they form a collective quad, which encourages collaboration between the differing material disciplines. The overarching idea being that the commonness of the materials actually enhances their value. 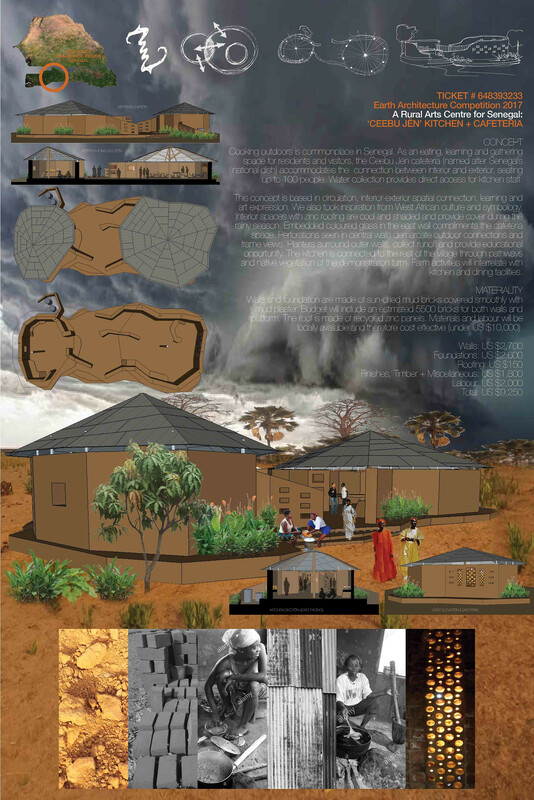 "Our long-term goal is to enable the rural population and lots of other places, to overcome the stigma, that mud architecture is architecture for the very poor"
Liberte Riche is distinguished by its exterior mud blocks that allow for sunlight and ventilation in what otherwise is typically dark, damp, and malodorous. Liberte Riche emphasizes richness on the importance of the space itself. Though mud architecture carries the stigma it is only designed for the poor, Liberte Riche rejects that idea. By uniquely stacking the mud bricks, it gives intentionality to the space itself having control of how much sunlight can go through the building and how much the outside can view what is inside. The interior rammed earth wall separates the sexes for privacy while showing its beauty on both sides. A waiting chair made of rammed earth is also available on both sides in case the toilets are all taken. Liberte Riche provides flushing through gravity flow from the rain water storage located above that then cultivates the flush toilet cistern. With the use of the same exterior mud bricks, a washing area exists outside the entry/exit area. Liberte Riche provides an aerated and light dappled space that enriches the space with comfort and significance. 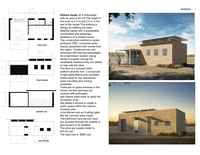 My primal goal of this project is to design a building that is sustainable and simple enough for trainee, yet still including some challenges that they can learn something from. Cob is made of materials that can be prepared locally and cost effective. The other main wall material, mud bricks, is contrasted against the cob as a chance to learn more than one method of construction in one building. Space between the cob and mud bricks is to serve as corridors that creates more shading in the region of tropical climate. Abundant openings should be useful for ventilation picking up the prevailing wind when open. Clearstory windows on the north side is also for the natural light decreasing energy use for lighting. Hollow bricks are used at the south side corridor where it’s not necessary to be enclosed. The ceiling is set high so that the hot air can rise to keep the area cool. The total estimated budget including local labor is $9,440. A library is a place where people come to learn and educate themselves. It is the Learning hub of the School. Located in the heart of the site the building is simple yet playful and attractive from outside, drawing people inside.On the outside, it looks like a solid building with an undulating playful Roof but on the inside, it is open to the outside nature, Playful, Interactive and a Focused Place which helps in the growth of the learners. The Parallel Walls protect the Interior Space from the Western Sun and provides proper cross ventilation of the Library. The Architecture of the building is comprised of Simple Elements and Materials composed in a Playful manner. Pivoted Doors and Windows raised above the user to open up and close the space according to the requirement. The Sunken Informal Reading Zone which kind of becomes the hearth of the building is a cozy Space surrounded by books and open to the outside for creative learning. The bookshelves frames the views of the outside. The Building is very porous on the inside having social spaces for Interactive Learning. Compacted Earth and Stone Filling with Cement Concrete layer on top of it. Our design team concentrated its work on the classroom type. Why? It is the place where they will learn how to build the other buildings of the compound. Basically we have organized the functions of a classroom, a lab, and a storeroom in an L shape plan around a circular entrance, then, the square roof gives to the architecture the sense of unity and provides the usability of an outdoor area too. This entrance cylinder is an element taken from the traditional water collector. In this case it is re-interpreted. It connects all functions required by the competition. Such space configuration is flexible to host all the different disciplines of the school. The systems for water recovery is relatively inexpensive the only limit is imposed by the capacity of the storage tank. Inspiring students to become lifelong learners is not only the job of the classroom but of every space that impacts the life of a learner. Senegal Seasonings serves as a space that allows students to relax for a meal or a quick bite as they converse with classmates over their current scholastic achievements and trials. As a simple open space, Senegal Seasonings welcomes students to freely sit on the inside of the cool, rammed walls or enjoy the outside covered area as the kitchen cooks up the local dish for the day. The white canvas roof and the light from the mud brick wall create an airy atmosphere for a much needed break in the hectic school day. With both a social environment for interactional learning and an economic design through passive solar energy, Senegal Seasoning utilizes local and natural materials. Gathering students around the table for a meal creates a space for peer to peer learning, invoking the environment of a classroom outside of the regular student teacher relationship of learning. the	toilets. The	hubs	are	separated	into	four	groups	to	give	it	a	semi-private,	semi-public	feeling. The Eartheteria is a space that captures the campus so the occupants can enjoy their surroundings in an immersive experience. The atmosphere inside the Eartheteria is designed so that nature, the campus, and meals can be enjoyed from a comfortable space. The project incorporates poured earth; the ground is built up to create the walls and also to create built in counter space and seating for the cooks’ and the students’ convenience. The structure is topped with corrugated metal sheets to protect individuals from the winter winds and summer sun. Wood beams create openings to embrace the summer winds and the winter sun to create the most ideal environment possible throughout all times of the year. The food making area placed on the east side of the earth walls allows for the smoke from the open-fire cooked meals to blow away from the students’ eating and gathering area. The students will be able to have their meals and take a break from their studies in a pleasant, enjoyable space inside the Eartheteria. Welcome to Recueillir des Pensées, a wonderful environment where artistic students can come share their creative ideas with one another and create extraordinary masterpieces. At the beginning of each day bamboo doors slide open and into the cavity of the walls inviting the students inside. These doors remain open to allow additional airflow throughout the day and are locked at night for security. Directly in front of the entrance is a mini nook with double doors leading to the workshop. Through these doors one will find a small atrium surrounded by four working pods which are the metal, wood, fabric shop and the earth construction studio. Two workshops pods on the viewers immediate right and left are identical elliptical shaped working pods. On the far end of the atrium are two circular shaped identical pods. In the center of the whole workshop is open space allowing students to come together and discuss their project ideas, difficult obstacles to overcome and accomplishments made. Openings are placed in every wall allowing wind to flow through cooling the spaces. Students will have an exceptional time here as they share a social and creative environment, growing and learning together. Our simple rectangular shape classrooms change time to time by moving light beams. We can smell earth and sense fresh air inside. We can see and feel the beauty of simplicity of earth, fiber and light. To achieve a comfortable, beautiful space with an acceptable IEQ (Indoor Environment Quality), some strategies are desired in these fields: 1. Material 2. Day lighting 3. Natural Ventilation 4. Thermal Comfort. The main idea was to build a public facility that lasts and which requires low maintenance, using local resources. The architectural design assumes several climatic principles, such as natural ventilation and lighting, or protection from the heavy rains and strong sun exposure. The library is organized into two different buildings surrounded by a “hallway porch”, a space often encountered within the traditional housing as it provides a shelter from heavy rains and harsh sun. Transparent coloured polycarbonate doors and windows create the interaction between inside space, the porch and the courtyard. The structure system is made of hearth bricks, characterized by closely spaced columns of 1.65 meters of interval, which also act as reinforce for the walls. The façades are perforated with different rhythm of bricks, so a continuous cross ventilation is guaranteed. The roof structure is made of wood and provide a ventilation system, while the palm leaves on top relieve the poor thermal performance of corrugated iron sheets below them. Almost 30 centuries ago, the Library of Alexandria stood just 4,000 kilometers east of Senegal, in Egypt, as one of the largest and most significant libraries of the ancient world. The aim of the original library space was to encourage study and research with a public collection of information that attracted scholars from all over the world. This library is still a place of encouraged enlightenment, but also a place to unite its community and safeguard its professional and cultural interest. Through design and construction, I have created a multi-layered space capable of accommodating exclusive needs while remaining in an overall inclusive environment. The duplex spatial design of the common area allows for two distinct masses to create a unique cohesive environment that goes uninterrupted as you are led out onto the balcony that overlooks the outdoor commons. The entire structure encourages decision-making and intentionality in progression as it relates to the space and may begin to fabricate the ties between the library space and the idea of afro-optimism. Senegal is a nation of strong people dedicated to their culture, especially their cuisine. Therefor, the dining hall is a distinct place for all to gather and build community and friendships. Centered in the Casamance region, South of Gambia, the hall is centered in the middle of the student’s dormitories. The hall is open to the landscape and expands from both directions to a central point for both the serving of meals and the entertaining for assemblies. The kitchen space is adjacent the hall to make for an easy transition from cooking to serving, while keeping the hall public from end to end. Providing spaces for friends to dine together, the hall’s exterior walls rise to 4ft and are 20 semicircular forms. The roof structure is set into the heavy exterior walls, and grows in height towards the center, where a concentric diamond pattern of purlins convenes. A layer of zinc sheathing completed the assembly of the building to protect the space from the sun and weather. The hall is placed in a central location to welcome all to eat and celebrate together. CONCEPT: Cooking outdoors is commonplace in Senegal. As an eating, learning and gathering space for residents and visitors, the Ceebu Jën cafeteria (named after Senegal’s national dish) accommodates the connection between interior and exterior, seating up to 100 people. Water collection provides direct access for kitchen staff. This concept is based in circulation, interior-exterior spatial connection, learning and art expression. We also took inspiration from West African culture and symbology. Interior spaces with zinc roofing are cool and shaded and provide cover during the rainy season. Embedded coloured glass in the east wall compliments the cafeteria space. Perforations seen in central walls demarcate outdoor connections and frame views. Planters surround outer walls, collect runoff and provide educational opportunity. The kitchen is connected to the rest of the village through pathways and native vegetation of the demonstration farm. Farm activities will interrelate with kitchen and dining facilities. MATERIALITY: Walls and foundation are made of sun-dried mud bricks covered smoothly with mud plaster. Budget will include an estimated 5500 bricks for both walls and platform. The roof is made of recycled zinc panels. Materials and labour will be locally available and therefore cost effective (under US $10,000). The structure focuses on intertwining education system and agriculture systems within Diakounda. The architecture provides an experience for the visitor as who are surrounded by its native agriculture, such as acacia trees and rice plants. It becomes a constant reminder of the importance of their land. Senegal, especially Diakoundo is victim to land loss due to degradation, which is the loss of land due to human intervention. The structure is integrating the essence of the land within the visitors of Diakoundo by surrounding them with trees and crops. The experience created by the nature within the architecture is one akin to comfort as trees grow in the interior of the building provide shade from the sweltering heat of the hot summers in Diakoundo. Students are given the opportunity to plant and nurture their own plants as part of the nursery section in the architecture. The nurtured and increased interaction with the agriculture will began to increase an appreciation for the land that is lived upon. Even when studying the occupants of the structure will still be unified from the agriculture through the slits within the wood which constantly expose them to the agriculture that rests behind them. gatherings. The techniques used are poured earth for walls ( though the initial investment in the formwork is more, a prototypical plan can definitely reduce the cost, since the formwork can be reused, and labour charge is very minimal too.) shelves and pivoted bamboo frames with woven reeds/ fabric/ metal/ wattle and daub for non- structural walls which acts as display panels for each of the department, CEB for columns and low walls, double roofing- a wooden reciprocal roof with zinc sheet and a secondary woven thatch roof and earth flooring. The project cost comes to around 9000$ for 2 classroom studios and one library which proves to be much lesser than the alloted budget for a single unit. Detailed budget is listed in the sheet. Just like many other cultures in the world, Senegal has its way of uniting people through food – In Senegal, the more you share, the more your bowl will be plentiful. Café Teranga fulfills this idea by embodying the cultural practice of Teranga. Teranga translates from Wolof, a Senegalese language that means hospitality. In Senegal, hospitality is more than an art and culture; it is a way of life. Teranga is the spirit of camaraderie, tolerance, and acceptance of one another. To honor the West African culture, the design seeks to unify people through the preparation and indulging of food in an environment that gathers all who inhabit it. Chefs prepare their cultural dishes within an open kitchen using the fresh, catch-of-the-day ingredients, while students enter the facility and proceed to the serving counter in search for their meals. Once the daily dish is prepared, the food will be displayed in the serving area where students will purchase and collect their meals. When meals are acquired, the students are now welcomed to the gathering/dining area where they can be seated around others of familiar and unfamiliar in order to socialize and feast on Senegal’s native cuisine. The Boabab tree, thick and mighty, gives off the appearance of a tree that fell from the sky and landed upside down. The ancient boabab tree has been around for 1,400 years, shaping African culture and providing resources to the local African villages. Just as the boabab grows, the Library of Life mimics the outstretched movements of the tree's branches, reaching across the landscape, longing to pull students in to share ideas and intellectual interactions. With the short, thick walls made from rammed earth sprouting from the ground, the zinc roof canopies over the ledge of the walls, providing comfort and safety to whoever comes inside. The walls wrap around the center space, enclosing students into intimate spaces to quietly study and learn. However, the entire library is not enclosed by these thick walls. The building breaks open in 4 axis, allowing for wind ventilation and unlimited light. The students are able to become one with the landscape while being in the comfort of indoors. As the boabab tree is called "The Tree of Life", the library gives life to the students by spreading knowledge and a sense of community throughout the campus. Design´s main idea was building in modules to make the project versatile for Africa. Building in modules gives opportunity to raise in gradual stages. It provides different configurations in other African sites. To achieve that modular growth goal the typical African impluvium was taken as an inspiration. The shape was improved from a circle to hexagon so the modules can easily attach to each other. Considering the climate issues the building is placed lower than the ground level and polycarbonate UV resistant panels are used to reduce heat inside. Passive cooling is also provided by the holes placed around the hexagon and by the water inside every module´s atrium. Modules are connected to fit Diakounda´s masterplan and bring water to the rainwater collector placed in the middle. One rainwater tank is enough to provide water for 5 modules throughout the whole year. Polycarbonate Roof Sheets 346$, Bamboo louver layer 520$, Wooden construction 560$, Rammed Earth Walls 50$ (this is for secondary parts, earth is locally sourced), furniture and plumbing 374$ and foundations 100$. It equals 1950$ per one module. Five of them cost 9750$. "a mind needs books as a sword needs a whetstone if it is to keep its edge"
The idea of the project has been inspired from the traditional African village which is formed of two units, public unit: the village and, private unit: the family space and houses. -The third zone without direct light is a media zone, to use computer or watch documentaries on tablets, or listening to audio books. the building is protected from the rain and the direct sun radiation by a wooden structure covered by roof in zinc material, its inclination allows rainwater to be rooted away from the brick walls. we reduced west–east wind effect by huge trees. We created a wooden lattice on the south to protect the southern façade from direct radiation all the day. Beside, the zone formed will be used as a public exchange space for the habitants of the village to promote access to information and knowledge, and preserve local culture. A crafted architecture that exploit the landscape, belongs to it and increase its possibilities. Our project is conceived as an open socialising area, originating from publicness and belonging to its community. The program is a Community Library, formally created as a place that invites the residents to pass through, sit, speak and understand the possibilities of knowledge and reading as part of their daily life. The experience of learning will occupy the central part in the master plan, accessible from all of its parts. The building is the simplification of what we can find in a common library, crafted taking into consideration the most common typologies of the area and creating a very flexible space, adaptable to any function. Reading areas are created in and out of the volumes, creating as well spaces for local art exhibitions, theatre, projections, readings, meetings. Mainly built using compressed earth and sand based mortar, coated with a mud plaster which gives the building its sculpted look, complemented with a simple timber structure that supports the metallic sheets of the gallery. The whole building is developed though the use of local available materials, where construction and educational values are blended together. Shading and natural ventilation are provided and local trees are planted inside and around the new structure, making it disappear among nature. The idea of creating four different typologies of construction answers to the need of educate through the act of making, experiencing, imitating and reconnecting to materiality, making of the art of building a moment of understanding the history of the place, learning and re-interpreting its vernacular architecture, depicting local skills and ways of transmitting knowledge through the act of making. visionary Richard Buckminster Fuller once said and he even went farer. To him, not only physical health dependents on hygienic, dignifying designs of sanitation buildings, but also mental health. To him, human growth only could happen, if ones personal space is granted and one is not preoccupied with worrying how to deal with humans most intimate physical needs. A valid point, considering that one of the biggest challenges in the educational sector in the global south is health related and could be tackled by improving the sanitation standards, while simultaneously foster gender equality. Therefore the most urgently needed open source type seems to be a sanitation building, providing safe, clean toilets and hand-washing stations. The suggested design therefore tries to come up with the most basic form thinkable, so that the sanitation situation is always customized to the aimed context and developed together with locals. The building size easily can be adapted due to the modular layout. The needed number of cabins comes along with roofed outdoor spaces which give room for handwashing-stations. Using local labor and their cultural knowledge the interest in sanitation is to be increased, because people often must be convinced of the benefits of spending money on toilets. Implementing an alternative waste management could be the key as conversation starter to a topic which is often silenced by cultural taboos and disgust. In Diakounda Arts village we could test taking care of human waste in a different way. We could save water, protect ground- and surface-water and simultaneously profit from the courage to do things differently. Water, westwind and wood. The scent, the feel of sandcrete and Wood, moist and dry, inside and outside. The east is protected from the morning sun by a sandcrete wall (blackboard). The westwind ventilates through a wooden brise-soleil. To the north and south, wet cloth stretched between pump supplied drainage channels keeps the air cool in the dry season (green). Quality wood frames the classroom. A large roof cantilever provides shelter to external seating where the rainy season evening sun and shadows from the trees play on the students. There could be sixteen viewers outside looking at the teacher through the mosquito screens. There are sixteen desks inside. There is a choice of where to sit. At a desk, on a locker, on a wall, outside, inside, looking or alone. Of a place make a multitude of places. The light from everywhere is different at each surface, dappled, shaded, high, low, filtered, reflected and so on. The overall site is redesigned to be open to the west with green planting and open water ponds with fish to cool down the west wind. The roof of the classroom is designed to eventually bear solar panels. The form is inspired from the pyramid or pagoda style of architecture practiced anciently mostly in Asian and African spiritual or religious entities. The particular form is believed to act as a resonator that attracts the energy from cosmos and renders on the inside. Hence, the particular form is chosen ,believing it to enhance the spiritual ambiance of the place. The structural members are also protruded out the façade for providing a support for maintenance works. we also aim to deliver a strong visual cue or entity which will serve as a remarkable landmark. We have mostly focused on using locally available material like wood for the structural members, staircase and hand rails; cement-mud mortar for the roof; cement punning for the floor; stone masonry for the foundation; wire meshes for the roof. The open plan fosters the flow of cool air fostered by the water bodies. The punctured roof facilitates the escape of hot air further helping in cooling the space. The thick blinds on the periphery blocks the direct sunlight. Shared house for 8 individuals, with an area of 52 m2. The height in the room is 3.2 m,and 2.8 m in the rest of the house.The building is design for fulfilling the basic dwelling needs with a sustainable, comfortable and pleasingly aesthetics of a modern home. The construction method is locally produced CEB (compress earth blocks) assembled with mortar from the region. Traditional low cost technique with thermal advantages. As a well known system, laying blocks is popular among the inhabitants therefore they are skilled to help with the labor. The floor is a rammed earth platform and the roof a compound of light steel beams and insulated metal panel for low maintained, quick mounting and cooling properties. There are no glass windows in the house, but the openings are covered with perforated, anti-insects steel mesh to allow the circulation of air. We added a terrace to create a public space within the various housing units. A full kitchen and an 8 sitting table fills the common area inside. The bathroom and service room are accessed through the outside to give privacy to its dwellers. The price per square meter is $19.23 USD. The total cost is $990 USD.